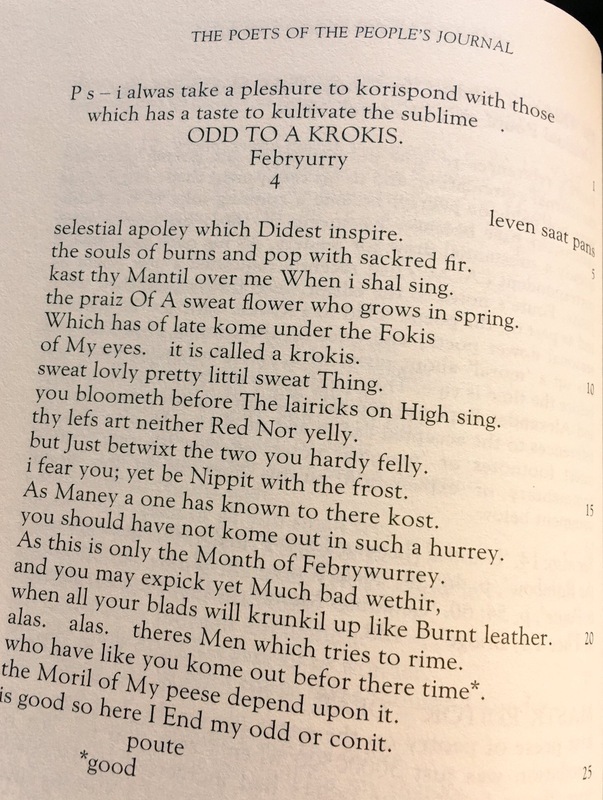 Reading The Poets of The People’s Journal, edited by Kirstie Blair, I am so far maist impressed by by the mock-rustic ‘Poute’ (Alexander Burgess), wha conducts a sort of omnisatire, in that he critiques mid-19th century assumptions about poetry, the lower class poet, poetry in Scots, and the means of its reproduction, using unorthography as well as literary allusion to do so. As Kirstie Blair argues in The Bottle Imp, Poute’s procedures influence even if they do not explain the tactics of McGonagall: ‘McGonagall was contributing to a pre-existing poetic culture that hovered between the satirical and the serious, and that caused difficulties for editors faced with deciding which was which.’ (The Bottle Imp, issue 14). This resistance to middle class mediators (like the subject of McGonagall’s first poem, the Reverend Gilfillan) and their interpretation of working class verse, relates to the William Letford review by Kate Kellaway I was discussing with Harry Giles and David Wheatley a couple of weeks ago on Facebook. Here’s that link. In other words, you can be foreignised or domesticated, though in each case in the terms of the classifier, naturally. Or you can do both/neither/something else entirely including rewriting the terms, as Burns and Letford might actually have done/be doing. It’s in this sense MacDiarmid’s title Scottish Eccentrics continues to yield meaning (a volume in which he wrote about, among other outliers, McGonagall): such centres behove us to embrace ‘eccentricity’. What if, as a sort of critical experiment, the Scottish literary tradition was redefined as precisely everything that cannot be read as ‘centric’ no matter how they/we try? 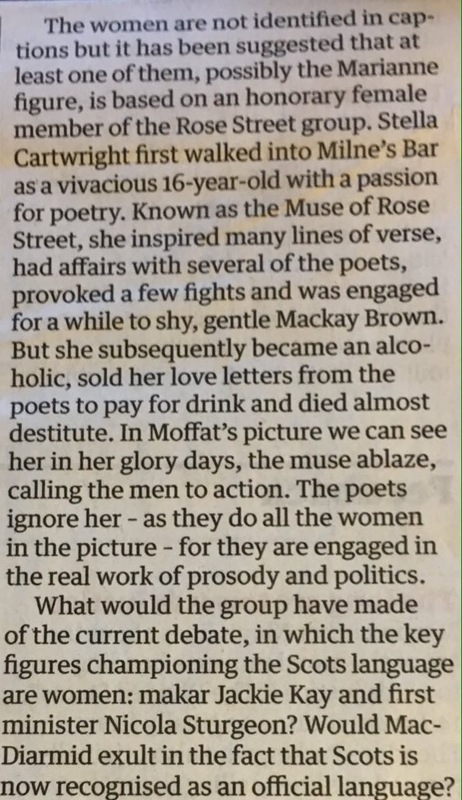 Also worth considering in this light is the Guardian Review article by Annalena McAfee, ‘The battle of the Rose Street bards’ (21st Jan 17), linking Stella Cartwright, the ‘muse’ of that gathering of poets around Hugh MacDiarmid (famously depicted by Alexander Moffat in ‘Poets’ Pub’), to the controversy over Jackie Kay’s contribution of a poem in Scots to the baby box to be given by the Scottish Parliament to every newborn. It’s an interesting article, but just as Kellaway’s piece moved seamlessly (almost literally in respect of that ‘heart on his ragged sleeve’) from Burns to Letford, it has no room to discuss how Scottish poetry gets from MacDiarmid to Jackie, which it does through figures absent equally from Moffat’s painting or the pages of the Guardian Review – W.S. Graham, Tom Leonard, Liz Lochhead, the aforementioned Informationists (whose group painting can only be imagined as a canvas by Stephen Campbell or Adrian Wisniewski – our prose counterparts would of course be depicted by Peter Howson or Lys Hansen). 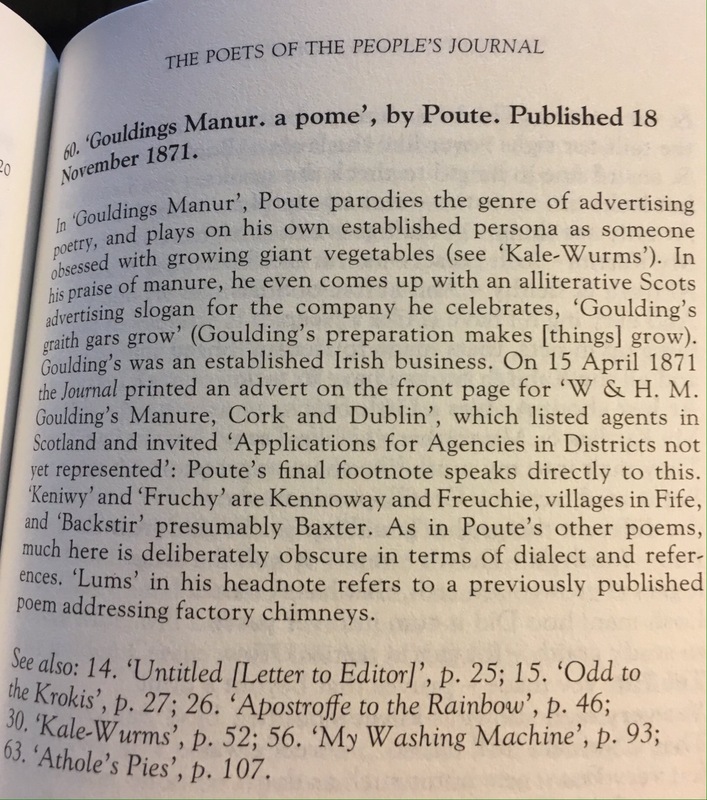 Therefore, for want of space, the auld argument Poute is satirising way back in the 1860s, that baith Kirstie Blair and Tom Leonard (baith in his ain work and in Radical Renfrew – in many ways a parallel volume to Poets of the People’s Journal) explore, goes roond yet again. Space, then, must equate to historical perspective, and that space which is made available is in turn subdivided by according privilege to the previously ignored, patronised or misunderstood. Here synecdoche substitutes for deeper analysis, which seems fine when the selected representative is, like Letford or Kay, amply deserving of praise. But that may explain why Poute liked to nip at the hand of his indulgent editor, or indeed why Stella Cartwright eventually went wary of the male praise of Rose Street. This entry was posted in current emanations and tagged 'Poute' (Alexander Burgess), Adrian Wisniewski, Alexander Moffat, Alison Flett, Annalena McAfee, David Kinloch, David Wheatley, George Gilfillan, Guardian Review, Harry Giles, Hugh MacDiarmid, Jackie Kay, Kate Kellaway, Kirstie Blair, Liz Lochhead, Lys Hansen, People's Journal, Peter Howson, R.D. Laing, Richard Price, Robert Burns, Robert Crawford, Stella Cartwright, Stephen Campbell, The Bottle Imp, Tom Leonard, W.S. Graham, William Letford, William McGonagall. Bookmark the permalink.